This Item is on backorder please call us on 01263 731585 to place your deposit. 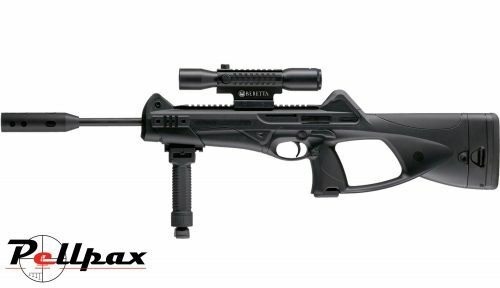 The Beretta CX-4 Storm is the best Co2 air rifle for plinking. Made by the world famous brand Beretta, this air rifles ergonomic design and user friendly features ensure you get hours of accurate, fun target shooting. The synthetic stock with the thumbhole gives the storm a very tactical look. The smooth bore barrel measures 445mm whilst the overall rifle measure 30.75 inches. Using 0.177 calibre pellets the CX-4 can shoot at around 600 fps making it highly accurate and very powerful. Using Co2 to propel the pellets you can get around 200 shots from one Co2 Capsule making this a low cost hobby. The CX-4 storm comes fitted with a integrated top rail to allowing accessories such as optics to be attached. The open Front sight fitted and rear sight on the CX-4 Storm is adjustable for windage allowing you to get an accurate shot time after time. This semi automatic Co2 air rifle has a 30 shot pellet magazine for fast, fun shooting. To finish of this gun the CX-4 Storm has a 2 stage trigger for pleasant comfortable shooting. With Walther QSB bipod, Walther 4x32 TriTac scope, accessory rail, 88g CO2 capsule, and silencer. To check out a review of the Beretta CX-4 Storm, head to the blog. Calibre: 4,5 mm (.177) pellet. Power Source: 88g CO2 capsule. Sights: Peep sight adjustable for windage; front sight adjustable for elevation. Add this item to your basket & spend an extra £90.01 to apply for finance.